This Tuesdays with Dorie assignment from Dorie’s Cookies by Dorie Greenspan is for Kamish, which is a mandelbrot (almond bread) recipe. The name Kamish comes from a woman named Toby Reichert, whose mandelbrot recipe was deemed as good as Dorie’s own grandmother’s version. This recipe is very simple, but it takes a little bit of time to complete because it bakes twice. The end result is very similar to a mini-cinnamon-sugar-covered biscotti. The ingredients for the Kamish are very basic: sugar, flour, eggs, oil, vanilla, cinnamon, baking powder, salt and almonds. This was one of the few times I didn’t have to go out and buy additional ingredients before baking. This recipe lives up to the almondy mandelbrot name. The first step is to chop up 2 cups of almonds. The dry ingredients were whisked together and set aside. The smell of cinnamon was so nice, I whisked the ingredients longer than necessary just so I could enjoy the smell more. The liquids were whisked next. I whisked eggs and sugar until they were a pale yellow. This would have been much easier to do with a stand mixer, but I guess I could have used the workout. More whisking. I added oil and vanilla to the egg mixture. My arm was feeling the burn! I gently mixed the dry ingredients into the egg mixture, being careful not to overdo it. The last addition was the chopped almonds. I gave the mixture a last good stir before popping the dough into the fridge. The dough was very soft, but firmed up after resting in the refrigerator for an hour. I divided the dough into fourths and rolled each quarter into logs. I didn’t include a photo of the logs because they looked like…well, they weren’t very appetizing. The Kamish dough puffed up nicely while they baked, and ended up looking a lot nicer than when they were just strips of dough. I was worried about the next step: slicing the logs into 1/2-inch pieces. Dorie’s recipe, spooked me into thinking everything was going to crumble as I sliced the Kamish log. I am so glad that Dorie said to use a long serrated knife! Miraculously, I only had one sad casualty; all of the other pieces survived! I sprinkled the slices with a cinnamon-sugar mixture and baked them again to crisp them up a bit. 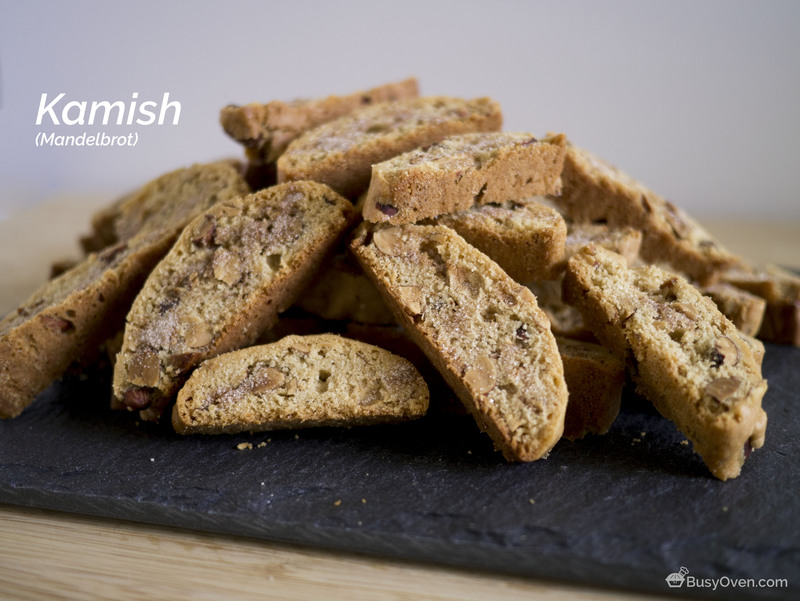 This recipe is very reminiscent of biscotti, but much lighter in texture. The Kamish cookies are nice and crisp, a little on the dry side, and aren’t overly sweet; the sprinkling of cinnamon-sugar on top of the Kamish reminded me of a grown-up version of Cinnamon Toast Crunch. The recipe from Dorie’s Cookies includes coconuts, but I omitted them because I’m not a fan. Overall, I really enjoyed this recipe! Good pick, Tuesdays with Dorie group! Kamish recipe is on page 280 of Dorie’s Cookies by Dorie Greenspan. We all loved these too! Great step-by-step images! It is always nice to not have to buy extra ingredients, and these could be whipped up at any time. The crumbs taste great on icecream! The crumbs and end pieces disappeared in my house. These were great cookies and I love all the almonds. Your cookies manage to look appetizing at every step. Just delicious! gosh, yours did slice so nicely! i had lots of crumbly bits (which i happily ate up before anyone else came in to the kitchen).